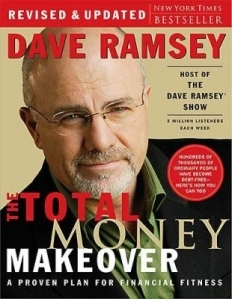 Win a Copy of Dave Ramsey's "Total Money Makeover"
Here’s another chance to win a copy of Dave Ramsey’s Total Money Makeover: A Proven Plan for Financial Success. To win, just write your favorite money saving, simple living or budgeting tip in the comments section below. I will randomly pick a winner at midnight, Pacific Standard time on Sunday, June 14, 2009. Please enter only once. I save money by having my paycheck direct deposited into my online savings account. I will only transfer out bill money and have less money to spend on things I don’t really need. Since it’s already in my savings account I don’t like to take it out, so it usually stays there. I refuse to pay interest or “fees” for anything. (OK, my 15-year mortgage was a major exception, but I still saved oodles of money by paying off in half the time as a 30-year). Also, I don’t pay someone else to do any work that I can reasonably and safely do myself., i.e. landscape care, clothing repair, meal preparation, bathe & trim dogs, paint house, cut hair, make cards and gifts, etc. This means no revolving credit card debt or car payments, ever. No billing fees. No account maintenance fees. No handling fees. This has meant occasionally doing without or using up something to the max until I could pay for a necessary replacement outright, but the financial returns in the long run have been enormous. Key to consistency with this system is having a reasonable emergency fund saved up in order to deal with life’s curve balls–sick pet, job layoff, mechanic’s bill–stressful events that wilt the best of intention and resource. I save money by having all my fixed expenses each month debit from my checking account. No more missed dates and great savings on “stamps & envelopes” x 12 months – adds up. These debits hit my account middle to end of the month. But I deduct all of these expenses at once, usually second work week,even though they haven’t left my checking account. I add up all of the paychecks left to come and deduct the next months mortgage. This way I know exactly what I will have left as extra for the month for all other spending (some months it’s not much, so I’m never tempted to overspend) and always have money for savings + the security knowing next months mortgage is covered. I haven’t been late with a payment or used my banks over-draft in over 15 years using this system. Love what you have! Enjoy where you are! Stop thinking about what others have or what you could have. Every time I get the urge to spend on something big, I try to love what I have. I take out our “allotted” money for the month, divide it into categories of expenses and keep it in a coupon holder. When the money is gone from the grocery category… that’s it for the month. So it means we have to spend wisely to let the money stretch through the month. Everything else stays in our savings account – we have several categories in our savings account – to save for rainy day expenses, bills that come once every 6 months and general savings – so when the bills come we aren’t surprised by them. When we moved to this system from using credit cards we started saving $200-$300 a month. If you don’t have the cash to buy it then you don’t have the money to buy it (no credit cards)! We don’t make payments or borrow money for anything. All cash, all the time. (We do have a free checking account with a free debit card.) No more keeping tracking of interest rates, late payments, mailing payments, etc. The past two cash-only years have been a revelation for us! Stay out of stores as much as possible. If I don’t need it, I can’t buy it when I don’t go shopping in the first place. I use only cash and, no matter what the cost of the item is — whether I’m using a full dollar for three cents or eighty-five — I spend only paper bills. Then, all of my change goes into a piggy bank (yup, I’m using the pig) at home. I may not put much in at any given moment, but it adds up significantly over time. I’ve used my change for vacations, for fun purchases I couldn’t justify spending real money on, for necessary evils like laundry, and to help defray the cost of an unexpected expense. I’ve found that I give in to impulse purchases (like going out for lunch instead of eating my healthy packed lunch) if I have cash on me. So I don’t ever carry more than a few dollars. I am less likely to stop for a latte if I need to use my debit card for $4.00! If I think I need something, I wait a month to see if I still remember that I need it. I almost never do or I find that in a month, I can find it free, used or gifted. Grow your own fresh tomatoes in a pot on the porch. We are a big family-6 kiddos + 2 dogs, my husband and myself. We love to travel. If we stay in hotels and eat out every meal, just a small weekend getaway would break the bank. So five years ago we bought a travel trailer. The best money we have ever spent. We are able to take all kinds of trips and if we stay in state parks or National parks it is $11-$20 a night. We eat food we would have eaten at home prepared in our travel trailer. Towing the travel trailer does reduce your MPG but only by a mile or two so their is the added expense of more gas but compared to 2 hotel rooms and eating out every meal, it is nothing. Also we never go far without a cooler, it helps reduce the impulse buys at the convenience store if you have sodas, vitamin water, waters, juice and snacks packed for all day outings. Rounding up to the next dollar in the checkbook… it’s like found money! I cook everything from scratch. It usually is cheaper and tastes amazing. It helps that I find cooking relaxing. At the end of a day of cooking I feel like I’ve spent a day at the spa. I know, I’m strange. I would hate to have my tight budget negatively effect the fun I have with my friends. So, if the plan is to go out for drinks or dinner, I usually get a minimal order – like one refillable pop, or eat a bit before I go out and get only an appetizer for dinner. What I’ve realized is that as long as you’re in good company, the amount that you spend on your outing has nothing to do with how much fun you have! I hate to have my tight budget negatively affect the fun I have with my friends. So if the plan is to do something that can be expensive, like going out for drinks or dinner, I keep my order minimal – like one refillable pop, or eating a bit before and then only ordering an appetizer. What I’ve realized is that if you’re in good company, the amount you spend has nothing to do with how much fun you have! Riding our bikes to the library for books, DVDs, CDs, and computer games that we don’t have and can enjoy for FREE–plus we’re getting exercise and fresh air and reducing our carbon footprint on our little corner of the world. I’ve started a blog with all kinds of deals and bargains I find – it helps me stay focused on saving money (I don’t buy the deals, just let friends and family know about them) and gets me excited to use coupons and see my savings add up. All “found” money goes toward debt. If there is a spare bill forgotten in a jeans pocket when I’m doing laundry, change left over from paying cash, work bonuses, etc it is all set aside and applied to the debt once a month. My husband and I also have a debt board. Each piece of paper on the board represents $100. Whenever we make a payment, we move the paper to the bottom of the board to show our progress. 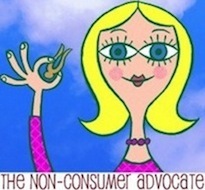 Plus, it helps us avoid extra spending because we know we’ll be able to “move a bill!” if we don’t buy something else. All of the above, and my own personal twist is to never enter a store unless I have a specific purchase in mind. That includes thrift stores. Also, try to only shop before or after work. That way you haven’t got a lot of time to spare, and you’ll get in and out without browsing. Stay home on your day off and cook. Hiding money in savings. Then forgetting about it. My husband’s working on forgetting about it. This way we earn interest monthly on it though. Because I have a 5 year old daughter who likes to go to movies, we go to the $1 theater for movies. They are not 1st run but we can see a lot of movies without breaking my budget. My children only wear hand-me-downs. I have 8 nephews and 2 nieces. My children are the youngest on both sides. I have made a round robin with my family on both sides and friends with children who fall in between. Meaning- the oldest boy passes his clothes to my nephews on the other side and they keep passing until they are worn out or too gross to wear! Everyone wins! We have also started doing this with games, toys and sports equipment. It saves tons of money and helps complete the circle. All families are happy-especially mine- they get multiples of desired items sometimes! My husband and I are trying out a cash only budget. It has really helped us get back in touch with how much we spend. Only drink tap water when going out to eat. Most places will serve water out of the tap at no cost. Especially good if you like water. Why waste money on bottled water? Be content. Make it a conscious effort to practice contentment and thanksgiving for what you do have. I am finding that this helps cut down on the “wants” in life. Before my grandchildren come for a visit, I go to my local library and pick out some children’s books to read to them when they are with us. I photograph the covers and send the jpgs to them by e-mail, so they have the fun of looking forward to the books we will share. My favourite saying is from my great-grandmother who died in 1953 …. before I was even born. “If a wolf ‘ll waste, a wolf ‘ll want”. Family lore has it that she had picked up a common expression of her time and corrupted it to her own understanding. The expression? “A willful waste is a willful want.” 🙂 True either way, I think. Be vegetarian or vegan—it saves money (beans are cheaper than meat), it’s much better for the planet (no more flatulent cows and huge pools of pig poop fouling the environment), and it’s healthier (less health care costs now and in the future). If you can’t got all the way, at least pick one or two nights a week to go meatless, or only eat meat on special occasions. I am a “tip junkie” because I love to learn new ways to be green and save money!! For me the first step and best tip is to have a total attitude adjustment! You can’t live with a deprivation mentality or feel that you are constantly missing out on things. Be creative and resourceful and be truly GRATEFUL for what you have. When you have those attitudes everything else seems easier and doable and life is a whole lot more fun and joyful!! I was raised by a “fixer;” my dad can jerry-rig and repair almost anything. We call him the King of Duct Tape and Paper Clips, and now I’m dating someone who’s just the same when it comes to fixing things instead of throwing them out. By valuing the things we have instead of automatically going out to buy something new, we save money and try to keep our trash footprint down. I eat a lot of meatless meals or meat is small quantities and lots of veggies, some that I grow on my patio. I’ve found some really great thrift stores and consignment shops with lots of current fashionable clothes and household items. I love interior decorating on the cheap. I get lots of books from the library and PaperbackSwap.com, clip coupons and use TheGroceryGame.com to save lots of money. We cook from scratch and love it. We make our own laundry soap. We love reading all the tips your blog has for us, thank you so much. Create a zero-based budget, which means spend every dime on paper at the beginning of the month. We know exactly where all our money is going, so we never have to worry about the bills. I wrote a post about it last week on my blog. I try to keep my three children active on our limited budget by doing things for free. This includes going to the library often to check out books and DVD’s, going to the library storytime and free kids shows, going to the park, using the public pool, seeing free concerts, having friends over for playdates, biking, walking, going to free museum days, doing crafts at home and anything else I can think of thats free! Coming in late here, but I wanted to stop by nevertheless and thank you profusely for posting this recipe. I made it for the first time today and frankly am gobsmacked by (1) how easy it is to make and (2) how cheap the ingredients are. As a side benefit, I feel like the three minutes of kneading at the beginning are very stress relieving. I can see myself making this a lot. Previous post: What Skeeves You Out?